242 pages | 28 B/W Illus. Large state temples in ancient Egypt were vast agricultural estates, with interests in mining, trading, and other economic activities. The temple itself served as the mansion or palace of the deity to whom the estate belonged, and much of the ritual in temples was devoted to offering a representative sample of goods to the gods. After ritual performances, produce was paid as wages to priests and temple staff and presented as offerings to private mortuary establishments. This redistribution became a daily ritual in which many basic necessities of life for elite Egyptians were produced. 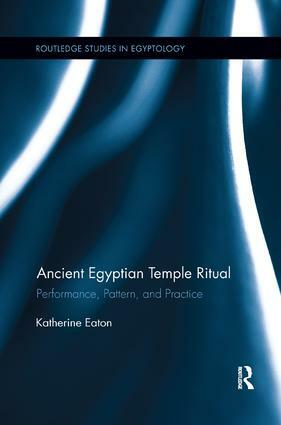 This book evaluates the influence of common temple rituals not only on the day to day lives of ancient Egyptians, but also on their special events, economics, and politics. Author Katherine Eaton argues that a study of these daily rites ought to be the first step in analyzing the structure of more complex societal processes. Katherine Eaton is an Egyptologist in the University of Sydney’s Department of Studies in Religion. Since receiving her Ph.D. from New York University in 2004, she has published in top journals, including Zeitschrift für Ägyptische Sprache und Altertumskunde and Journal of Near Eastern Studies.